My current WIP and NaNoWriMo project is about a love triangle. 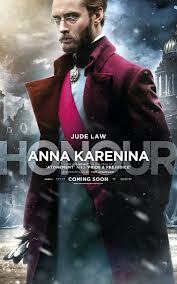 And, so I get to write off my movie ticket for Anna Karenina as research. I love period movies about society and scandal. The way the people dressed and passed letter back and forth is romantic and mysterious, to me. What happen to those good old fashion counts and princesses? “Anna isn’t a criminal, but she broke the rules!” – on why Anna was shunned by society. “Sensual desire indulged for its own sake is the misuse of something sacred.” – How romantic. Seriously. “Your husband is a saint and we must all cherish him for Russia’s sake.” – Feeling guilty Anna? “We are bound together by god and this can only be broken by a crime against god!” – Alexei trying to hold on to his wife. “You may, by indiscretion, give the word occasion to talk about you.” – Alexei knew his beautiful wife might be prone to give into temptation. He was trying to protect her. “My wife is beyond reproach. After all, she is my wife.” – Alexei still protecting his wife. “The man who can’t govern his wife, has gone as far as he can go in government.” – remember, this movie took place in 19th century Russia. “There can be no peace for us, only misery, and the greatest happiness.” – isn’t that what love is all about. “Romantic love will be the last delusion of the old order.” – So sad. I enjoyed the movie and the innovative way Joe Wright filmed the movie as if it was a stage play. Very clever and put a new spin on movie making that lately seems to be consumed with robots, CGI action and the military. What did you think of Anna Karenina? Do you enjoy movies like this and The Age of Innocence (in my top 5 and another good love triangle)? What are some of your favorite love triangle stories? And, from this day forward, please refer to me as Countess Sydney Aaliyah. Haven’t seen it. And I’m impressed – did you take notes during the film? On this one, I did. Usually, if I really like a movie and write something like this where there were so many elements I loved, I will see it twice. And, no others in the theater to bug when I am speaking into my phone. haha. I’ve been wondering if this movie is worth the hype. Maybe I’ll check it out. Thanks so much, Fel. I really liked and I don’t like Kiera Knightly, so must have been good.